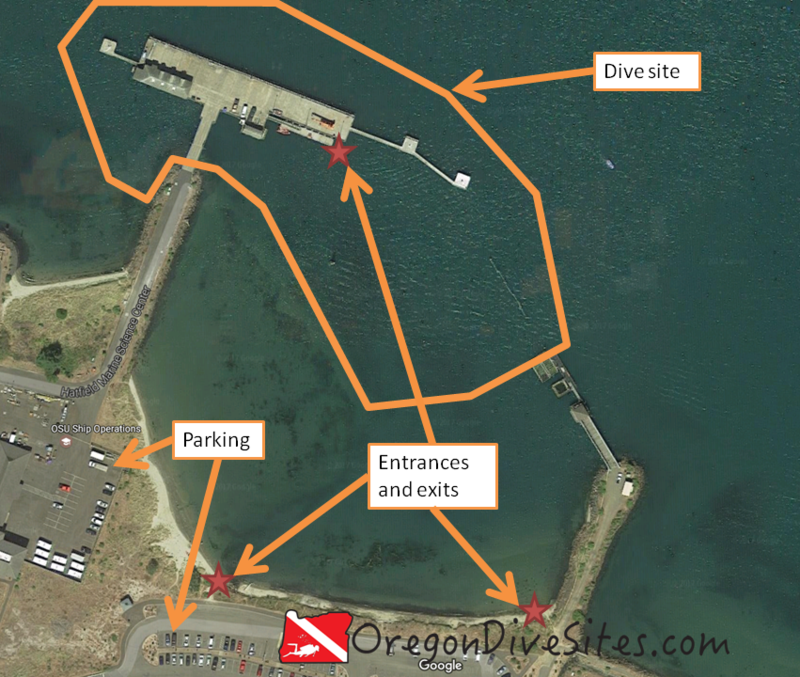 The OSU Research Dock is a fun place to dive if you like looking at the bottoms of ships or if you want to check out some of the marine life on the piers. You absolutely MUST have permission from the correct authorities (we highly recommend having it in writing and carrying it with you) before you dive. Due to the recent relocation of the NOAA fleet, the police are very sensitive to people diving here without permission. Underwater you will find some interesting anemones, sometimes some lost research hardware, and we once found some bones we thought might have been human in closer to shore. 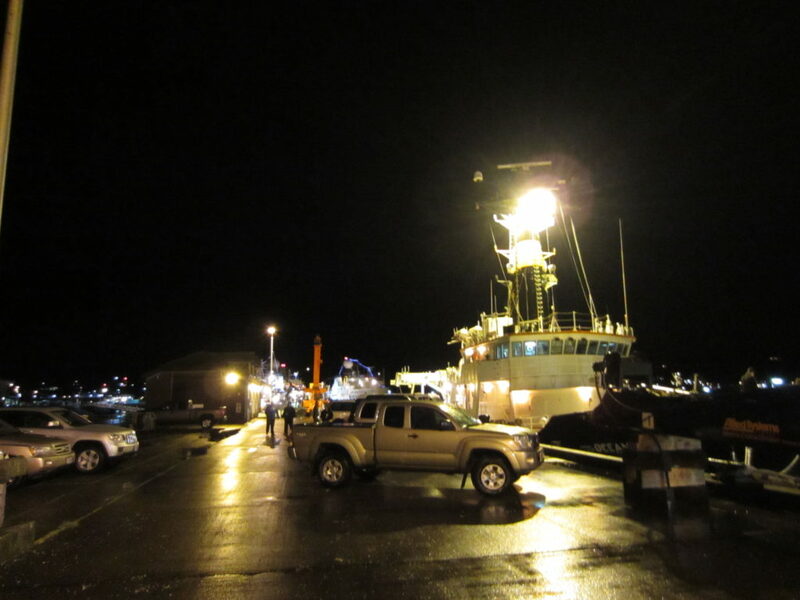 The R/V Oceanus at dock at night. Only people with special permission can dive on this site. The OSU Research Dock is a fun dive though so if it interests you, you might as well ask for permission. The big highlight for us at the OSU Research Dock is diving underneath the R/V Oceanus, the R/V Elakha, and the R/V Pacific Storm when they are in port. We have spent time looking over the boat hulls, inspecting the zincs, and seeing what interesting marine life grows on these ocean-going research labs. There is also quite a bit of life that lives on the piers that hold up the dock. We have seen quite a few anemones on the pilings. If you head toward shore, things get shallow fast. We found some bones out there once that kind of looked human but probably were from a deer. Any Oregon State University (Go Beavs!) fans or students will want to dive this site to have bragging rights with their friends. There aren’t that many universities with their own research dock! Take the aquarium exit from US101 and then follow the signs to the OSU Hatfield Marine Science Center. When you get permission from the Center, they will tell you where you can park. There is parking along the shore where you most likely will get permission to park your car and assemble your gear. If you know the right people, you might be able to park in the maintenance yard at the edge of the pier. If you’re really lucky, you might get to park out on the dock itself although don’t count on that! Imagery ©2017 Google, Map data ©2017 Google. The OSU Research Dock is a fun site to dive but you absolutely MUST ASK AND RECEIVE PERMISSION from the correct authorities. We strongly recommend you have it in writing and carry it with you. You don’t want to surface to a state cop waiting for you! The dock runs roughly east-west. To the south of the dock, there are some mud flats and the water intake structure for the Hatfield Marine Science Center’s many salt water tanks. You’ll want to stick around the dock. You probably will be entering and exiting along the south shore and then swimming out until the water is deep enough to start diving. If you’re lucky and have permission, you might get to dive from the dock itself but don’t count on this. This is a shore dive although if you are attached to the Hatfield Marine Science Center, you might get to dive this from one of the research ships. Usually this site is pretty calm although as you head north from the dock, the current through the Yaquina River can really rip. At high tide, expect to have 10-15 feet of visibility. Depending on what the river is doing, you will see 45-55F in the water at the OSU Research Dock. Any time of year this dive site can be fun. If you go out into the channel to the north, you can sometimes find 30 feet although normally you’ll be around 20 feet near the docks. Open water divers can successfully dive this site although you need to watch above you for the hulls of ships. You don’t want to smack your head into one! This is a pretty easy and straightforward dive. The hard part is getting permission to dive this site. Depending on where you are allowed to park, you may have to walk over 1000 feet to get to an entrance. Depending on where you’re allowed to enter, you may have to do a surface swim of over 1000 feet. You absolutely MUST 100% have written permission to dive this site! If you don’t you may find yourself being questioned by state police when you surface. It’s not a bad idea to fly a dive flag here to make sure anyone working on the research vessels at the OSU Research Dock are aware of your presence. We have our tried and true dive flag listed on our Gear We Use page. We suggest you try getting in touch with some of the ship operations people to see if you can get permission to dive this site. If you’re a current or former Beaver, you have a better chance than if you’re a Duck. In the South Beach area of Newport there is a good local dive shop that offers air fills, can repair gear, has gear for sale, and rents gear. On both sides of the bay there are good restaurants and brewpubs. We recommend South Beach State Park’s campground. 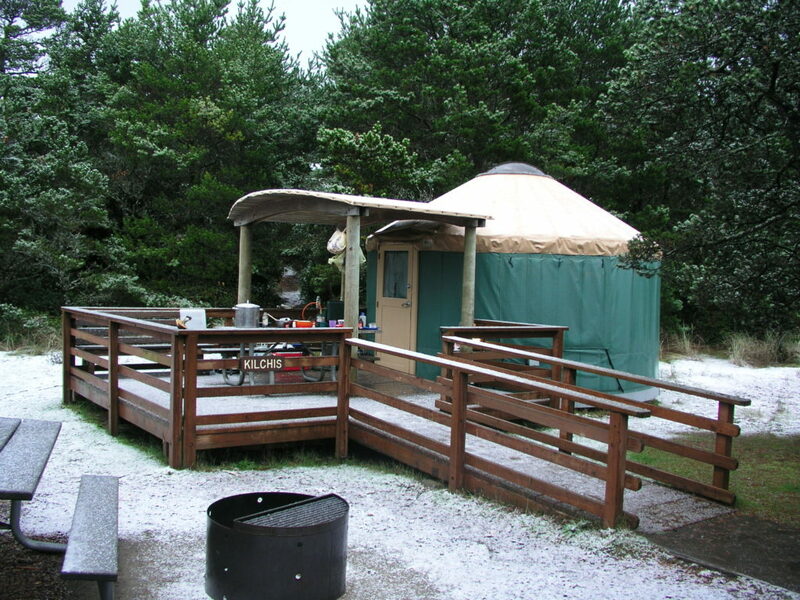 We particularly like the yurts on cold winter days. If you know of a good SCUBA diver friendly hotel in Newport, please let us know!